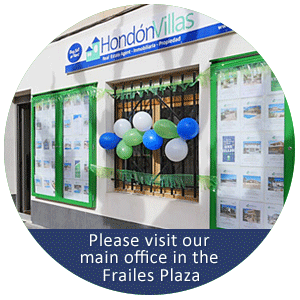 After a very successful 2017, Hondon Villas are pleased to announce we have recently taken possession of new and bigger offices in Hondon de los Frailes. We are still in the main Plaza but just a few metres down the street, near the 28 Restaurant. Look for our signs! Our current office is our 3rd expansion in five years. It is due to increased demand for Hondon Valley homes, villas and apartments... we just need BIGGER offices! We have also taken on more staff, increased our rentals portfolio and sold more houses in the area than any other agent. We smashed our sales target again and kept us extremely busy. As I write the team and I are very confident that 2018 will be an even better year for Spanish property. With our AIPP best practise and better legal checks we are confident you can buy safer in the Hondon area. That's a worry off your mind. It is particularly pleasing that the local people support our real estate business and that many Europeans are still buying and selling property in the Hondon Valley area. That's despite the predicted downturn in Spanish Real Estate and of course the Brexit vote. The Hondon Valley is still an inland secret that attracts a discerning, peace loving and friendly mix of nationalities. Of course we all now live in uncertain times but the indications are that there are still an abundance of foreign property investors wanting to buy and live in Spain. Spanish property is such great value right now. Long may it reign! Here's to the future and please call into our local office in the Frailes Plaza if you wish to buy, sell or rent your Hondon area property. We are always happy to help. My best wishes to all our clients... see you soon!